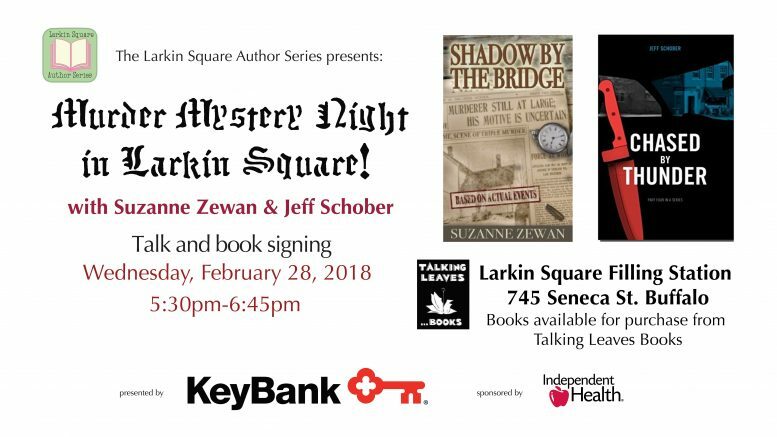 Local authors Suzanne Zewan and Jeff Schober are scheduled to take part in Murder Mystery Night in Larkin Square, part of the popular Larkin Square Author Series. The event will take place from 5:30 to 6:45 p.m. Wednesday, Feb. 28, in the Filling Station, 745 Seneca St., Buffalo. Zewan’s “Shadow By The Bridge” and Schober’s “Chased By Thunder” were recently released by NFB Publishing, a Buffalo-based publishing company owned by Buffalo resident Mark Pogodzinski. Books will be available for purchase at the event through Talking Leaves Books. The event, free and open to the public, is presented by KeyBank and sponsored by Independent Health. In “Shadow By The Bridge,” 11-year-old Fritz Reynolds recalled his father telling him that man is the only creature who can find amusement in killing. Little did he realize that those words would become the theme for his teenage years growing up in the rural hamlet on Linden, N.Y. In this coming-of-age story, Fritz takes us back to a simpler time when neighbors gathered at the general store to listen to radio shows, drank barrel-aged cider and worshiped at the Baptist Church every Sunday. All was picturesque in his close-knit farming community until terror was unleashed on them. For more information on these and other works published by NFB Publishing, please visit www.nfbpublishing.com. And for more information on Larkin Square, please visit https://larkinsquare.com. Be the first to comment on "Local authors to participate in Murder Mystery Night in Larkin Square"